The occipital neuralgia is normally cause by the trauma to the occipital nerve, which is possibly caused by the auto-accident during which the head impacts the headrest. Additionally it may be caused by the spondylosis of your upper cervical spine. It may also rarely be caused by the neuropathies due to tumor or diabetes. During occipital neuralgia the nerve is possibly entrapped beneath the trapezius and the muscles of the occipital bone called semispinalis capitis. 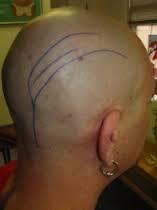 It is usually characterized by the paroxysms of occipital pain, which has resemblance with the migraine. In extreme cases when pain is very severe then blood pressure may also shoot up. The eye pain is also reported with the occipital neuralgia. In some cases the dental pain has also been reported. The severe pain which may be in the trigeminal distribution is reported in human having excessively greater occipital nerve. Due to variant of cervical vertigo some of the patients also feel dizziness. The occipital nerves are the nerve that run right from the top of spinal cord and to the base of your neck up to the scalp. These nerves may be injured or inflamed. It is mostly confused with a migraine and other headache types because of the similarity in the symptoms. 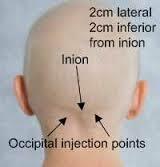 But occipital neuralgia is a disorder which require in time diagnosis and treatment. 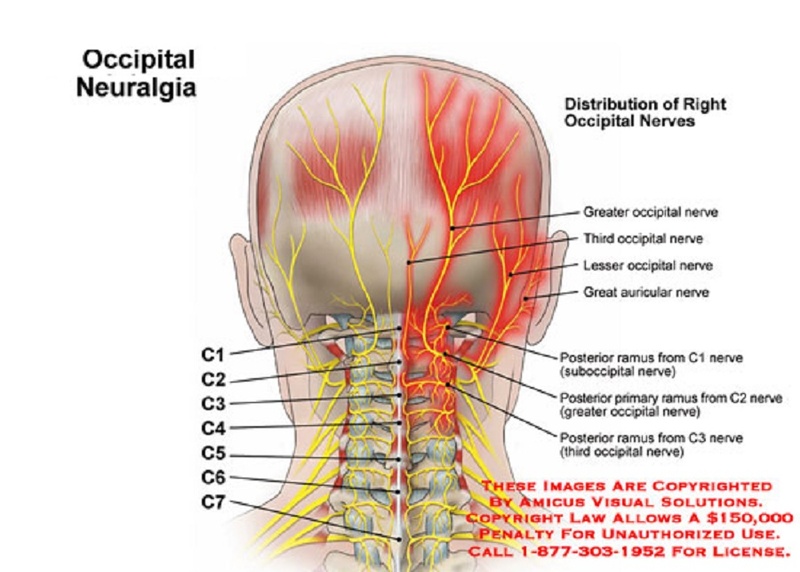 Occipital neuralgia results from the compression or irritation commonly of your occipital nerves due to some kind of entrapment of the nerves, injury or may be due to inflammation. In most of the cases no cause behind occipital neuralgia is found. In case you think that you are affected with occipital neuralgia then immediately consult with your doctor. He may ask about your complete medical history and any kind of injury which may happen due to any physical exam. He will definitely press the back side of your head where he may think that the suppression occurs due to occipital nerves. In most of the cases it is clinical disorder but he may ask for blood tests or MRI scan if your case doesn’t looks like the typical. To relieve the pain he may give you an anesthetic nerve block. 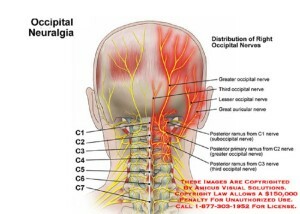 If the pain goes away then occipital neuralgia is the possible cause of the pain. For better treatment complete diagnosis is necessary. For example if you are ikely to be affected by the occipital neuralgia and are given medications for migraine then it doesn’t work. If this doesn’t work the best then you doctor may advise the following medicines to treat the pain due to occipital neuralgia. You can also use short term steroid injections and nerve blocks. These are not very much effective and take 2-3 injections for many weeks to get relieve against pain. Microvascular Decompression: this procedures follows the identification and adjustment of the blood vessels which may contribute in compressing the nerve. Occipital Nerve Stimulation: this procedure follows the use of a neurostimulator to delivery of electrical impulses to your occipital nerves. The function of these electrical impulses is to send messages to the brain related to the pain. It is not considered under the headings of life threatening diseases. In most of the cases pain can be minimized by taking pain relieving medicines and pills. But if you are not getting the response from these medications and pain remains there then tell your doctor about the condition of your neck and head. If the condition become worse then you need medical attentions and hospitalization. The alternate is the physiotherapy. You need to consult with proper physiotherapist, he may advice you neck and head therapy which will give you a relief and discomfort goes away. Along with physiotherapy laser treatment can also be done which might open the closed nerves which are causing pain. If all these treatments are not responsive then surgery is the only thing which you can do to get relief against pain. Don’t be panic if your pain is not going away because this is not contagious and life threatening disease and you live your normal life. But always avoid all those activities which are known to block the nerves and avoid sudden accidents as well. this will minimize the fact of having occipital neuralgia and feel you comfortable.